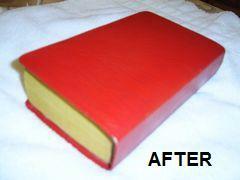 Leather book binding restoration and Bible binding was another service that Lermont's Shoe Service offered that other shoe repair men don't. 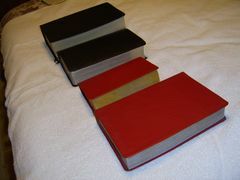 If you have a unique book or an heirloom book or an antique Bible that needs book binding repair or book binding and restoration, then take it to other book binding specialists or check out what's available here. My Dad's specialty was shoe repairing, but a simple book binding repair was an additional service that he provided at his shoe repair shop. He used genuine leather in different colors. 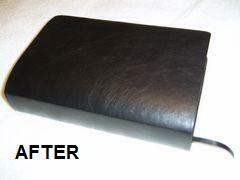 As you can see in the photos below, he did not restore the existing cover, but he replaced it with a plain genuine leather cover. 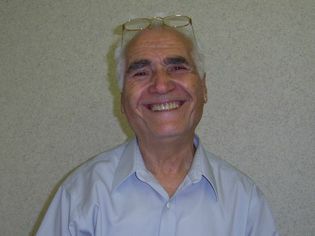 He also did not reprint the book title or the author's name on the front and back covers, nor on the spine. 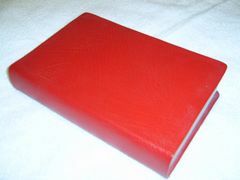 My Dad Lermont was your book binding repairman if you had books with worn out covers, or you simply wanted to replace fabric book cover, paperbacks and hardcover books with genuine leather covers. This Russian-Armenian Dictionary was printed in 1945 in Yerevan, the capital city of Armenia. 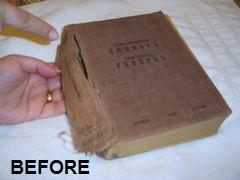 As you can see in the "Before" photos, its fabric book cover was all torn and falling apart. That's what I was pointing to in the photo above. In these "After" photos of my Russian-Armenian Dictionary, you can clearly see how good the leather book binding cover looks. 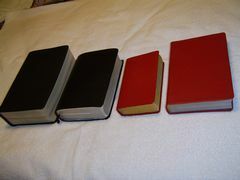 My Dad Lermont made my old Dictionary into a brand-new book by replacing the old torn apart fabric book cover with leather book binding. I love what my Dad has done. 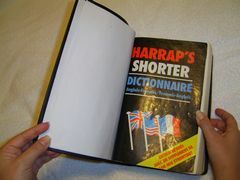 My Dictionary looks great! 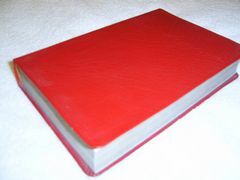 Check out some of the book binding materials available here. Unfortunately, we don't have "Before" photos of Patrick's Dictionary. At the time we did not know that we were going to build a website for my Dad, and that's why we did not take "Before" photos. Now, Patrick and I wish that we did. The hard cover was so worn out that Patrick used duck tape to barely hold it together. 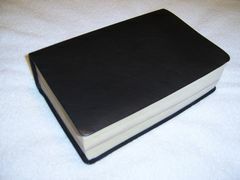 But as you can see, the Dictionary looks absolutely wonderful after my Dad Lermont did a binding book by hand using high quality black color leather. 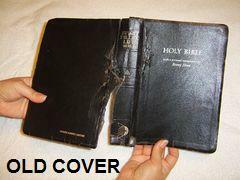 I had this Bible since the 1990's. When I bought my Bible, I believed that it had leather Bible book binding because on the back cover it said, "Genuine Bonded Leather." 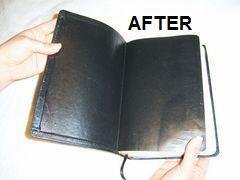 But when my Dad checked it, he noticed that it did not have leather book binding. 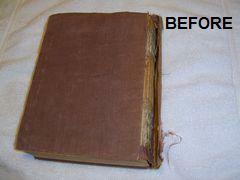 In the "Before" photo above, you can see how worn out the Bible book binding was. But in the "After" photo above, you can clearly see the big difference. 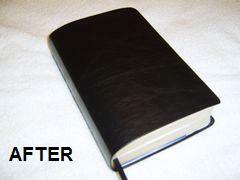 My Dad Lermont replaced the old Bible binding book cover with a good quality genuine leather. I found some very interesting Leather Bindings, and you can check them out here. In the "After" photo above you can see how well my Dad Lermont fixed the book binding even inside the cover. In this other photo that says "Old Cover," I tried to hold the old cover in a bit of a different angle so you can see the torn section a little better. My Dad explained that real leather will never tear like that. 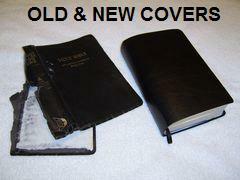 In the next photo above, you can see the huge difference between old and new covers. 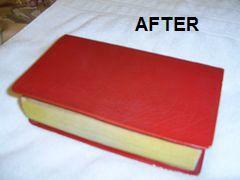 To fix book binding my Dad used a book binding repair process and replaced the leather book binding for my Bible. 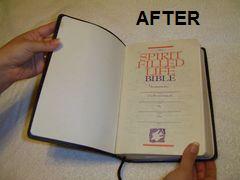 Looking at the "After" photo at your left hand side, you can see that my Bible looks brand-new. And it is real leather book binding! 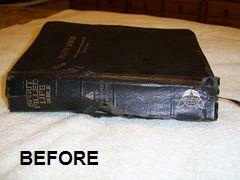 Next, you can see the "After" photos of my King James Version (KJV) Bible. Unfortunately, I don't have the "Before" photos of it. 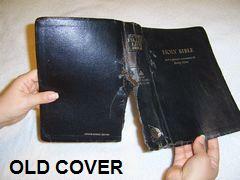 The original cover was not worn out or torn at all. 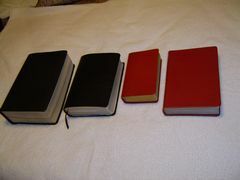 My husband Patrick and I feel so proud of my Dad Lermont when we look at these books, the two Dictionaries and the two Bibles. These books represent my Dad's handiwork that will last for many years to come. Lermont is really a talented man! 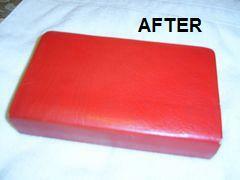 We do not know any other shoe repair man who can do leather book binding in addition to shoe store services. Do you? As I said at the beginning of this page, my Dad's specialty was shoe repairing, but a simple book binding repair was an additional service that he provided at his shoe repair shop. He used genuine leather in different colors, not just red and black. 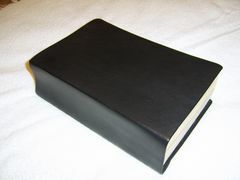 My Dad Lermont was your book binding repairman if you had books with worn out covers, or you simply wanted to replace fabric book cover, paperbacks and hardcover books with genuine leather covers. However, since he does not work anymore, you can check out what's available here. His shoe repair shop was convenient to visit if you lived in the Foothill Boulevard area, in Tujunga, La Crescenta, La Canada Flintridge, Burbank, Pasadena, Verdugo Hills or Glendale. 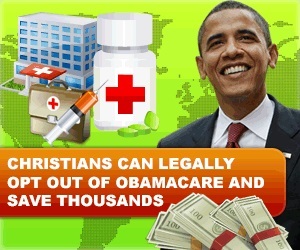 Some of his customers drove all the way from Hollywood, West Los Angeles, San Fernando Valley and Beverly Hills. You can check Google Maps to see where Lermont's Shoe Service used to be located.